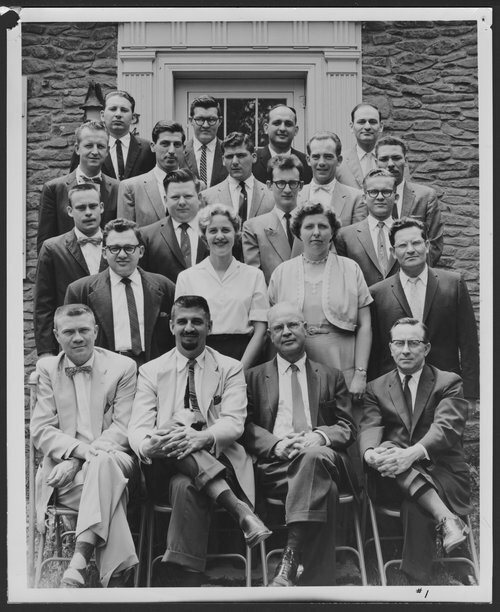 The staff shown are (seated) Charles Solley, John Santos, Gardner Murphy, Riley Gardner; (2nd row) Ralph Fisch, Avis Cline, Lolafaye Coyne, Howard Shevrin; (3rd row) Louis Heitlinger, Charles Snyder, Walter Kintsch, J. Leander Lohrenz; (4th row) Robert Long, Arnold Gerall, Bernard Holliwell, John Long, Edward Turner; (5th row) Martin Kirschenbaum, Harold McNamara, Lawrence Stross, Lester Luborsky. Menninger is a leading psychiatric hospital dedicated to treating individuals with mood, personality, anxiety and addictive disorders, teaching mental health professionals and advancing mental healthcare through research. It was located in Topeka, Kansas, from 1925 to 2003 and is now in Houston, Texas.